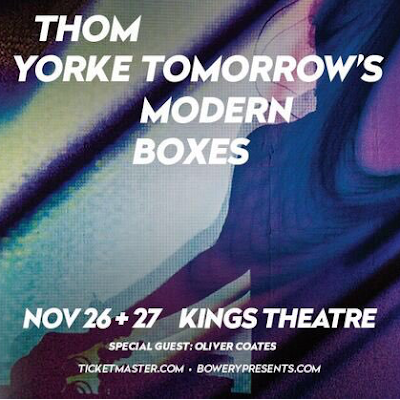 Ever since Kid A, it's been apparent that Thom Yorke's interests reach beyond amazing guitar anthems and post-punk and also ranges from electronics with a focus on pulsating bass lines and dubstep rhythms to piano driven ballads that tug at the heart strings. On his latest outing, Yorke has landed on a “a live electronic performance featuring Nigel Godrich and audiovisual artist and frequent collaborator Tarik Barri” to bring his solo tracks to life. Unlike his tours with a full band to support The Eraser and playing as the group Atoms for Peace, this time around finds Thom at his most stripped down and vulnerable. If anything, this show really makes it clear that Radiohead is a true band and not just a vehicle for Thom and Jonny Greenwood to experiment with stellar talent. With only Nigel by his side, it's rather clear that this music may be better suited over headphones and in an intimate setting, rather than in an impeccable theatre with fans grasping for hits. Hiding behind pearly white keyboard and laptop stands, the stage felt sterile and a bit alien with massive video screens behind them to add immeasurable depth. The tracks from Tomorrow's Modern Boxes were still rhythmic and full of bass, but there was little to truly engage the crowd and surprisingly, there was only one song from the Suspiria soundtrack played all night. Thom did his standard dance routines which did get occasional cheers from the crowd, but everything was far from the rapturous applause of a Radiohead gig. Of course "Black Swan" was an expected favorite that sounded rich with texture as did "Cymbal Rush" and "The Clock" which brought back some steady reminders of a time in the mid-aughts, but also felt exciting and thrilling. Where the musicians themselves fell short, however, the visuals helped bring a bit more life into the show. Constantly shifting patterns ranging from technicolor laser beams to sprawling ink blots enhanced the music ever so slightly to give the night perhaps its most memorable moments. As the group returned for the encore, "Atoms for Peace" gave the night a jolt that carried on to "Default" for the most energized section of the entire night. It's fun to see an artist so respected dabble into a new frontier, push their limits, and take risks. If anything it makes one grow fonder for what was missing. 02 "A Brain in a Bottle"
05 "I Am a Very Rude Person"
10 "Two Feet Off the Ground"